Published in 1929, the Plan for General Development was commissioned by the Metropolitan Town Planning Commission. The Plan of General Development was a planning scheme to prevent 'misuse' of land and protect property values. It highlighted traffic congestion, the distribution of recreational open space and haphazard intermingling of land uses. 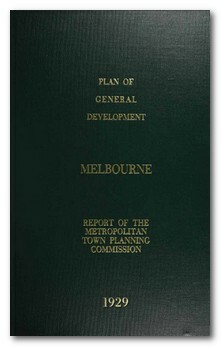 The plan identified a number of problems, such as the congestion at St Kilda Junction, that were not addressed until decades later. The plan also recognised the value of Melbourne's waterways as an open space network. To obtain full digital copies of the plan, or for assistance in accessing these documents, please contact the Victorian Government Contact Centre on 1300 366 356 or email us.